Create BIN Folder by right clicking in solution explorer and selecting Add Asp.Net Folder option and Put itextsharp.dll in it. Place One Button on page to Create PDF in Click Event of it. 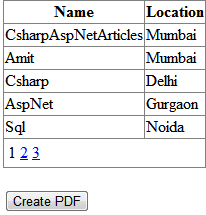 Place one button to create PDF from Gridview and write below mentioned code in Click Event of Button.